Hey there amazing Friends, and welcome to Trash-to-Treasure Tuesday!! Ya’ll know I love this day…not only am I sharing a much-needed makeover, but I get to do it with five of my favorite treasure-maker friends! I can’t wait to see what they transformed. Be sure to look for links to their projects at the bottom of this post! I picked this up at the thrift store for $25, hoping I could love it back to life. Funny story…I decided to go to Hobby Lobby and pick out new pulls in hopes of inspiring an idea for this makeover. I always look at these beauties every time I stop in, wishing I had a project to use them on, so I decided this was the one. Wind Speed by Behr. 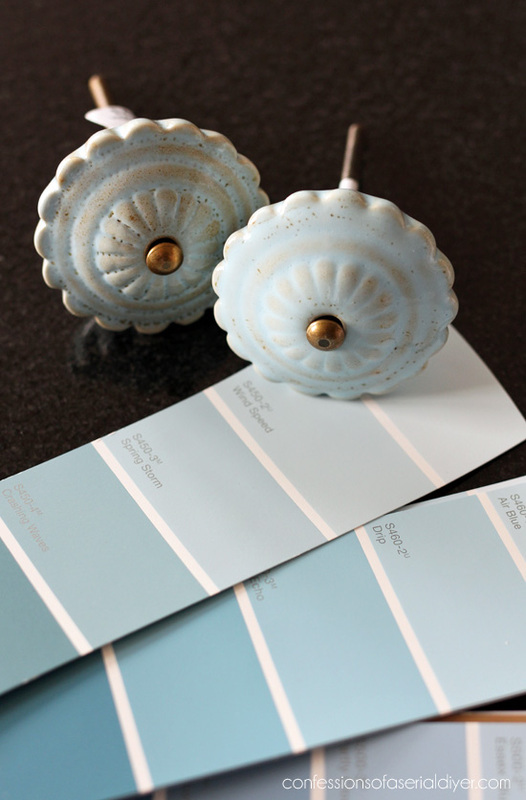 What are the chances that I would just happen to have a half gallon of this beautiful soft blue in my garage? 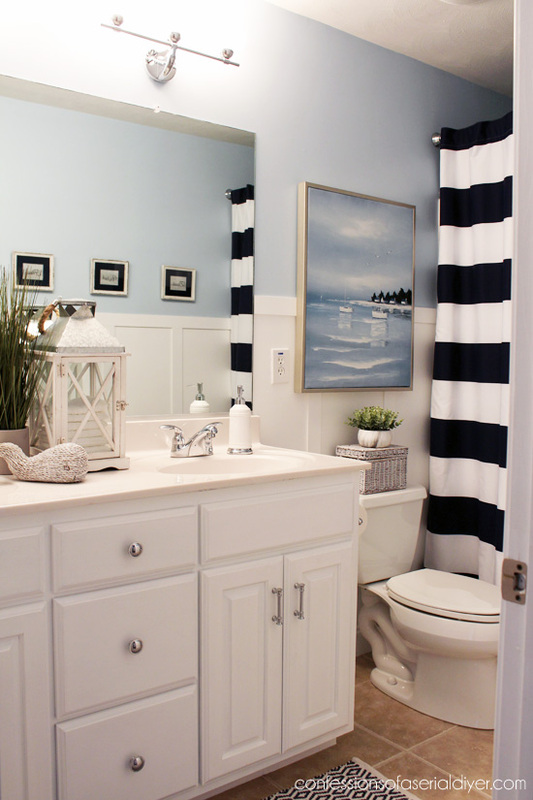 This is the color I used in the boys’ bathroom! See that makeover HERE if you missed it. I am happy to report that it worked just fine! I started with 100 grit, then 220 grit. 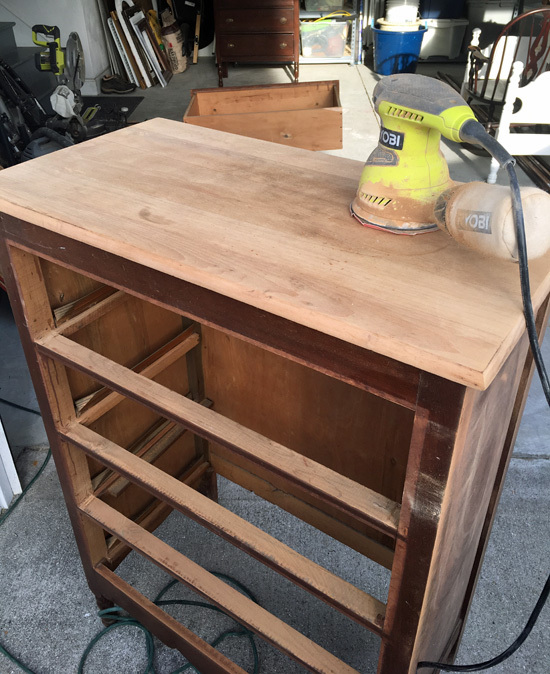 Next I sealed the rest of the dresser with shellac (applied with a foam brush), knowing it would likely be a bleeder. Then I painted like normal. It took just two coats for solid coverage. 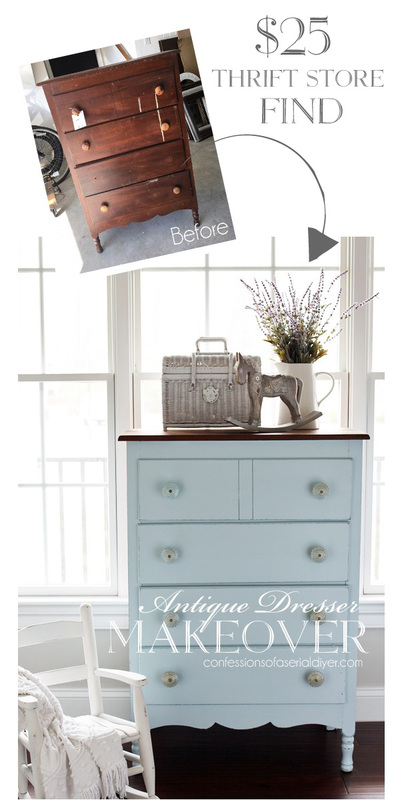 Visit my complete tutorial for chalk painting furniture HERE. Then I sanded lightly here and there with 220 grit sandpaper, and sealed with Annie Sloan’s Clear Soft Wax. I stained the top with Minwax Dark Walnut and sealed with Wipe-On Poly. The top came out really nicely. 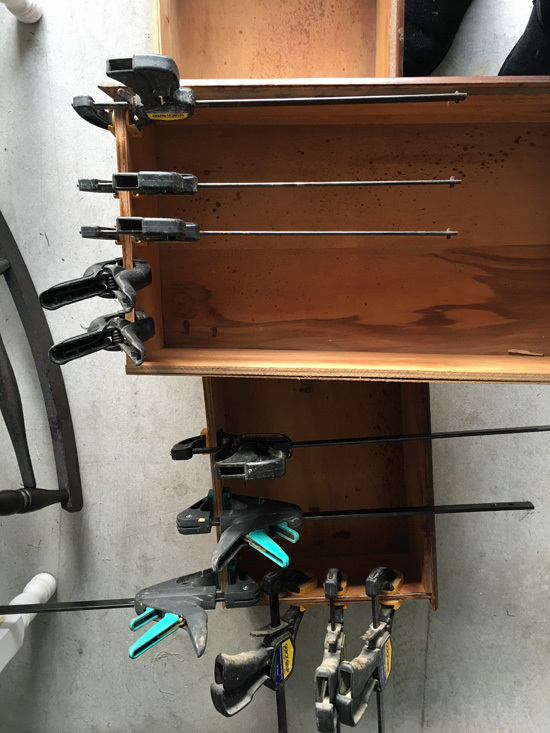 There’s a good reason that clamps made it into my Top 10 Essential Tools for the Workshop list! This was AFTER a good wipe down. That red spot is where a warhead candy had melted. I decided to stain the sides of the drawers as well to make them look better. I used my Minwax staining cloths in Walnut. They sometimes go on kind of opaque, so I used a rag to wipe off the excess. I didn’t get a before of the sides, but trust me…they look much better now! 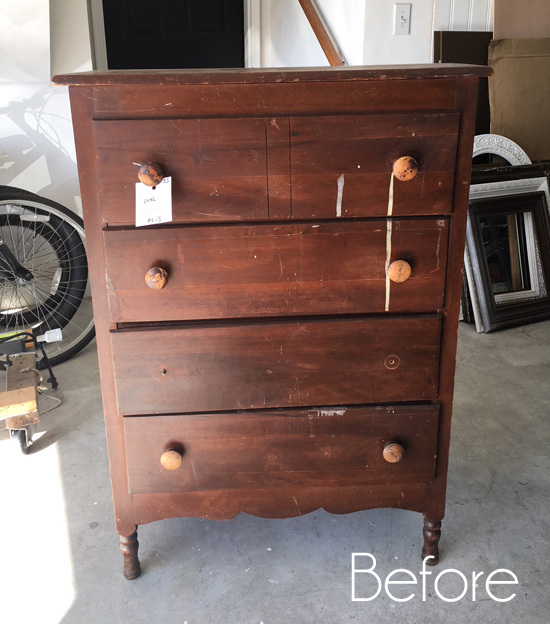 I considered painting the sides, but with this dresser having so many issues to begin with, I didn’t want sticking drawers to be another! How pretty is that? I found this at JoAnn Fabrics. 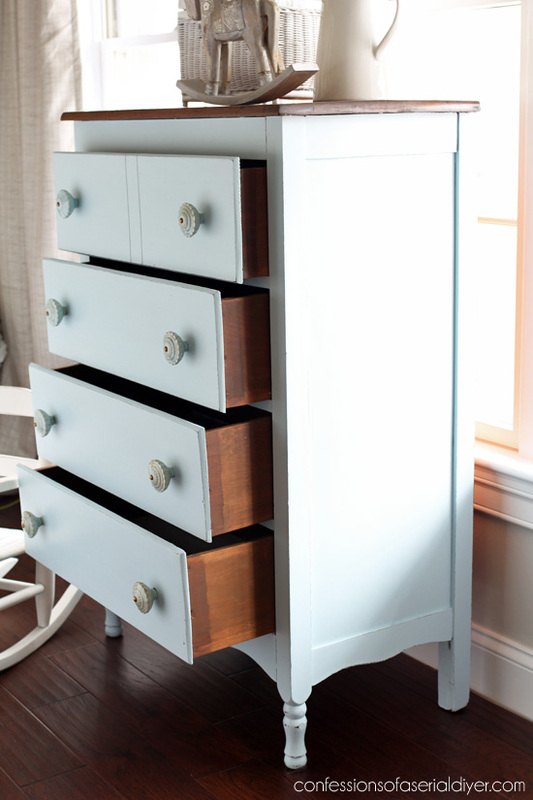 I love this pop of fun color when you open the drawers! I used my rotary cutter and cutting mat to cut the fabic, then adhered it to the bottom of the drawer with matte Mod Podge. 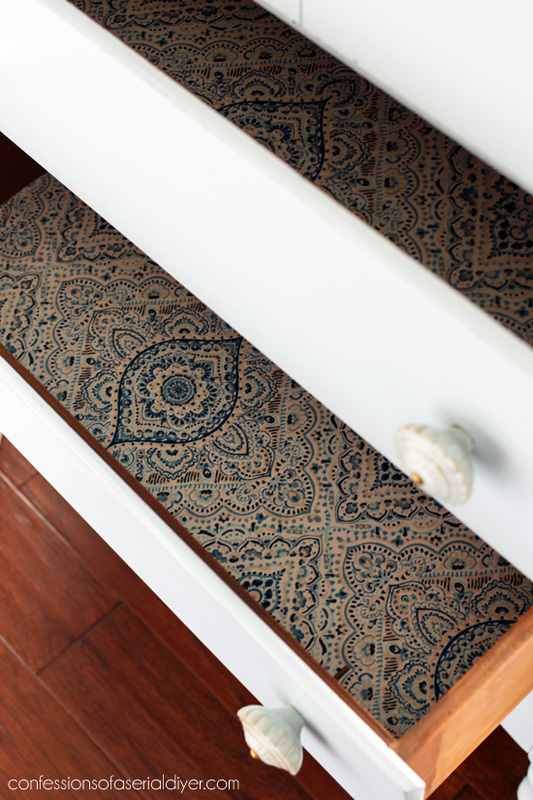 Today at 1:00 pm I will be sharing live in our Make it New Facebook Group exactly how I add the fabric to drawers! I know it’s not rocket science, but if you’ve never done it before, a video demo is always nice! If you aren’t a member of our group yet, it is about everything upcycled! Click HERE to join, then be sure to come on over while I’m live today at 1:00 pm EST and say hi! Don’t forget to visit my friends’ makeovers too! Looking for even more makeover inspiration? 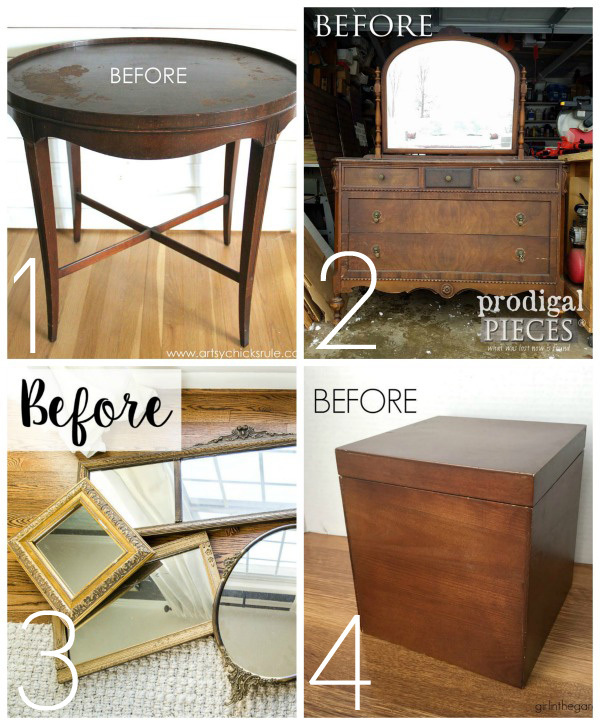 Visit all my Trash-to-Treasure makeovers in one place HERE! 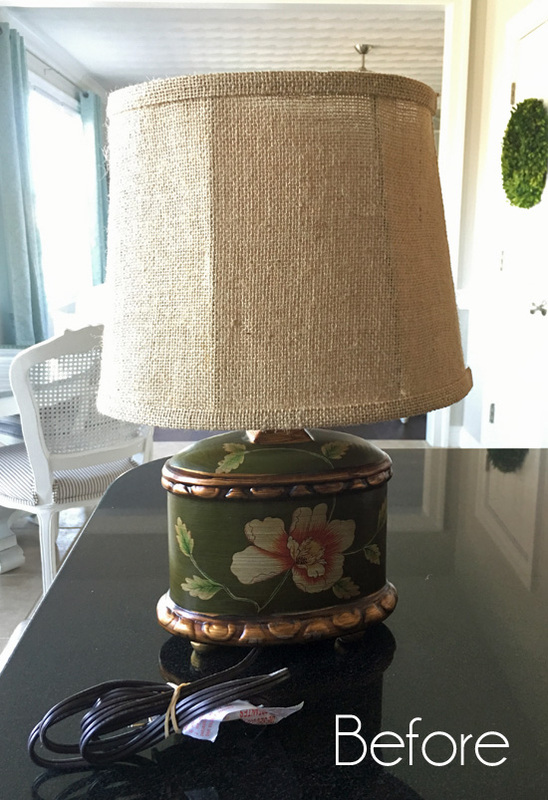 UPDATE: Check out how this lamp got a coastal-inspired update HERE now! I Love it. That turned out so beautiful. I think you are amazing! Thanks for testing the satin finish into chalk paint, I always buy satin finish, now I know it will work for chalk paint. That piece is adorable. I do not have a face book account, can you join without one? Gorgeous makeover! Love the color, and that you stained the top. 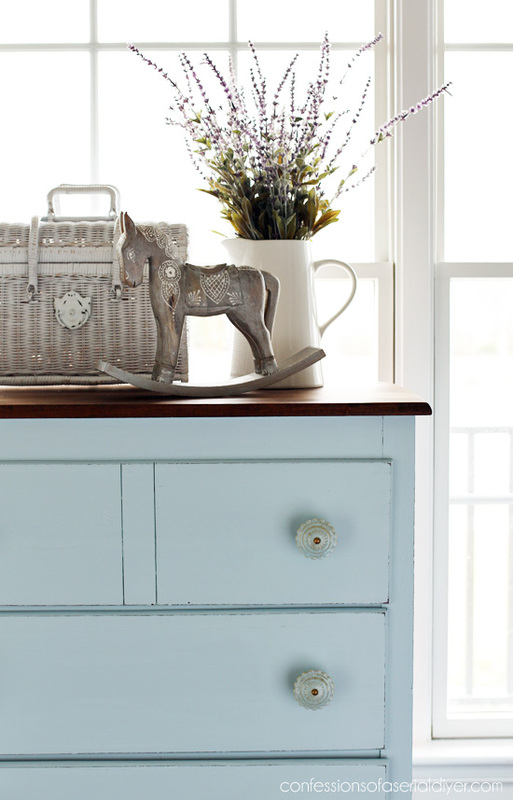 The pretty little pull knobs are the perfect addition in finishing it off. I just knew it was going to be great when I clicked on it Christy! It is beautiful!!! 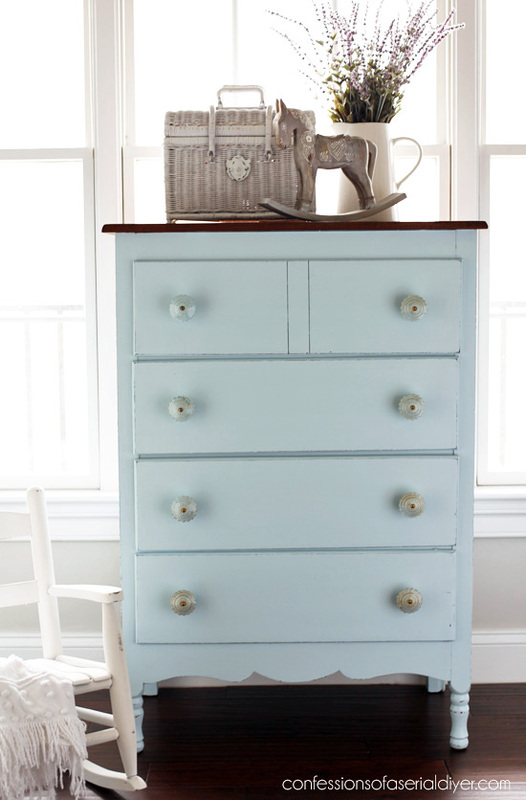 The color is perfect and so is the knobs. I’d love something like that in my home 🙂 Nice job girl! Oh Christy, she is beautiful! Look at those “stud earrings” on the drawers! Perfect! She is a beauty. 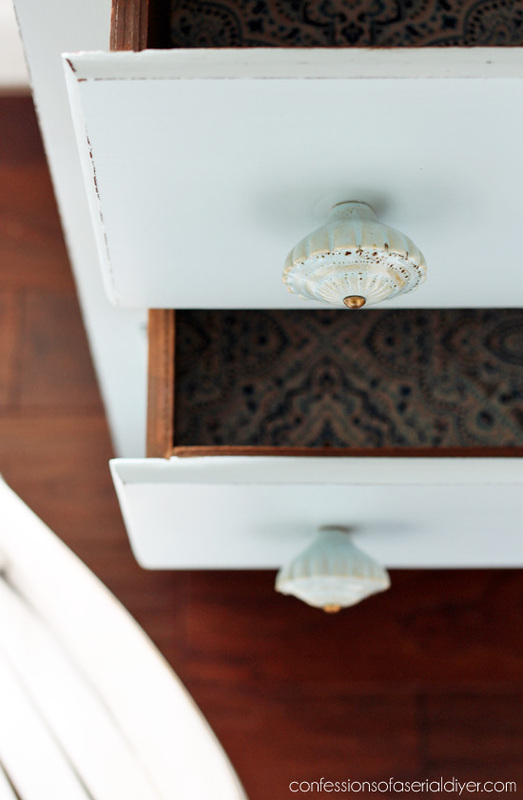 I adore the drawer details with the stain, painting and fabric. Beautiful. Sorry I’ll miss you live today (due to my job) but, hopefully, it is up as a video and I can watch it later. Have a super rest of your week and weekend. What a beauty of a find and your recreation of it is spot on. Well done, Christy! 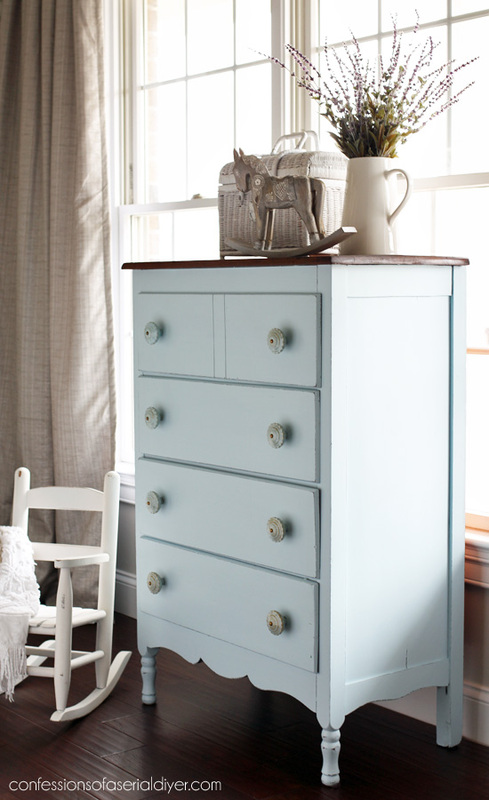 Love it….great color and I like that you left the top in the natural wood. So pretty!! Just lovely, Christy! The dark top looks beautiful against that blue. 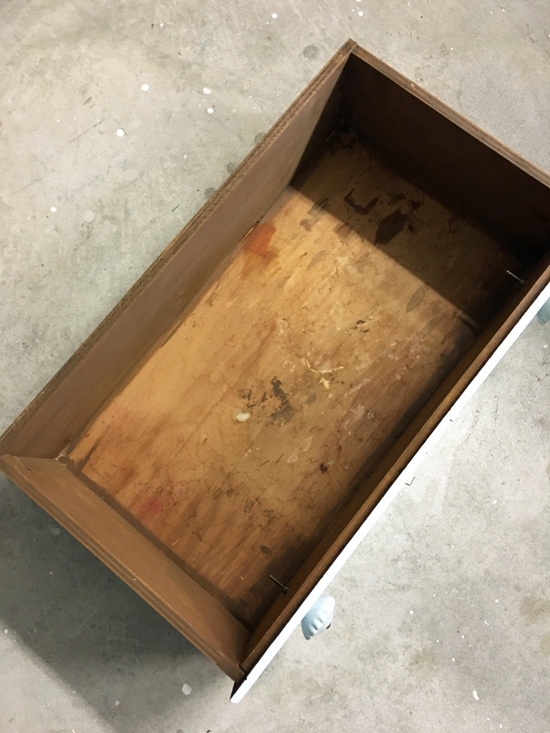 I can’t join the live demo of how to line the drawers with fabric; will you be saving the video so we can watch it later? I would love to see how it’s done. Great job on this project! I hope you and your hubby have a great Valentine’s Day! I have so much to say about this post it might be a long one! First, love your boys’ bathroom! Next, great tips on fixing things that are damaged. And, lastly, thanks for the links to other posts you have done. I was at one of our local Goodwill stores this morning and I picked up a suitcase. Thinking of doing something like you did in one of your posts. I spied a cute little pedestal table but while I was thinking, could I ship it if I sold it in my Etsy shop, someone else snapped it up! We’ll you what they say, you snooze, you loose! 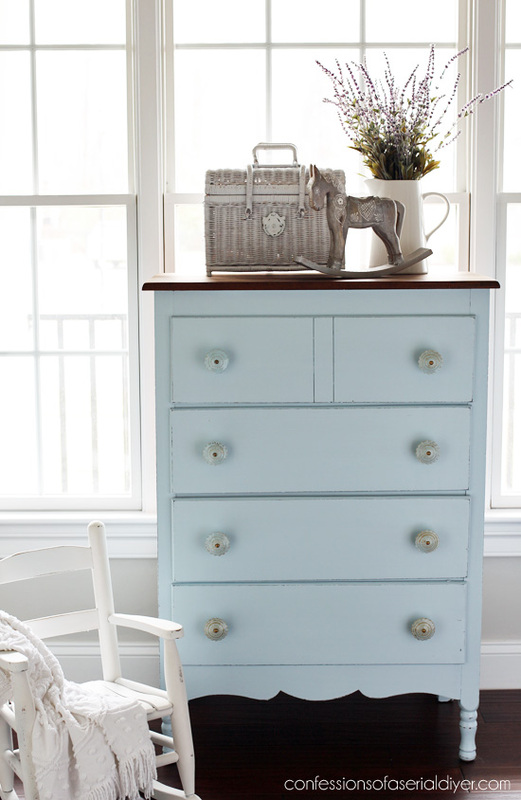 Anyway, love the way the dresser came out and nice to know you don’t have to use flat paint to make chalk paint. Yes, I remember to do that next time! Gorgeous job! The repairs you made were much needed and made it much improved. 😉 That fabric is perfect with the color and knobs! It turned out beautiful. Love the fabric you used inside. I just had to tell you, the dresser turned out beautiful. I loved the stain top and the knobs. To me the knobs really made it pop. 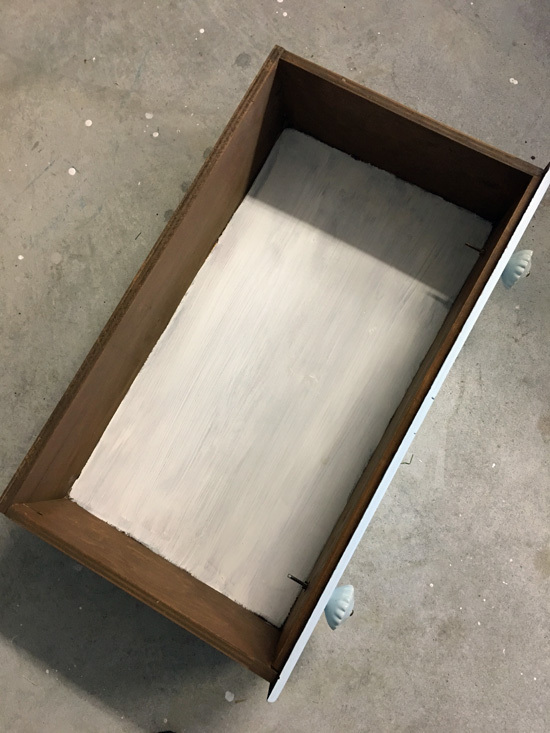 When you paint a large piece like this, do you hand sand or with sander lightly? 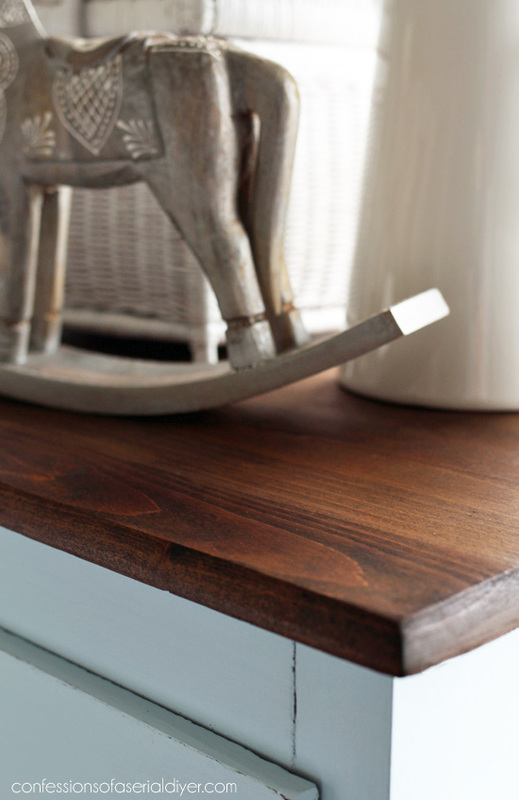 When you finished with the stain on top, do you put a sealer on top? Thank you very much for sharing. I’m curious how you address the excess screw sticking into thedrawersfrom the new knobs. I’ve passed on this type because I fear clothing getting damaged or someone reaching into adrawer and getting cut. Do you hacksaw off the extra? That would still leave a sharp edge. Hi Christy… I’ve visited your blog many times & find your work awesome!! 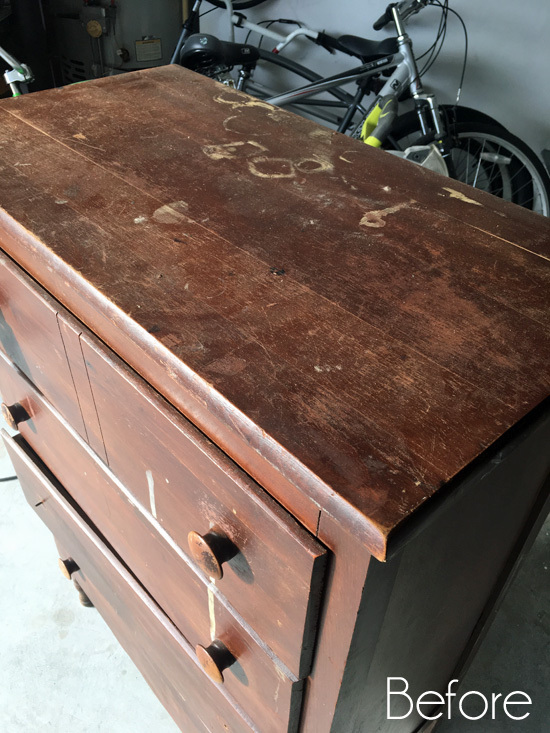 So, I finally signed up for emails today 🙂 I have one question about this piece: did I understand correctly that you used shellac on the dresser BEFORE you used the chalk paint? Thanks for the great tutorials!